It’s a story as old as time – a rising star burns bright but is cut down before achieving greatness. 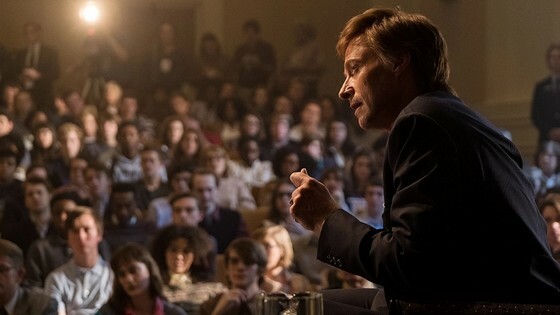 But Gary Hart’s fall – at least as depicted in Jason Reitman’s compelling The Front Runner – is more spectacular than most. Reitman has always been an astute observer of human nature. From his exploration of an ethically-challenged executive in Thank You for Smoking (2005) to his portrait of a mother in crisis in Tully (2018), Reitman has always been interested in what makes people tick. Here, he keeps that trend going; but also raises some broader moral questions about the line between public life and private life, and about the role of the press. The Front Runner is a portrait of a man and of a marriage; but also an exploration of a country losing its way. After a brief prologue about the 1984 US presidential election, Reitman jumps to the 1988 campaign. Hart (Hugh Jackman) is the favourite for the Democratic Party’s nomination; and possibly for the presidency itself. A deep thinker and persuasive speaker, Hart has everything going for him. But hints emerge suggesting all is not as rosy as it seems. Hart’s wife Lee (Vera Farmiga) seems distant and his daughter Andrea (Kaitlyn Dever), troubled. But there’s little time for family as Hart throws himself into a whirlwind of personal and media appearances leading up to the announcement of his candidacy. Campaign manager Bill Dixon (J. K. Simmons) uses all his experience to keep it all afloat – and for a while, things seem to be humming along perfectly. Then Hart decides to take a little break from the hustings in Florida. A seemingly innocuous boat trip will prove fateful as Hart meets Donna Rice (Sara Paxton). Back in the campaign, Hart manages to get members of the press corps offside by seeming to favour young reporter AJ Parker (Mamoudou Athie) because he’s with the Washington Post; not some “regional newspaper”. One of those miffed pressmen is Tom Fiedler (Steve Zissis) of the Miami Herald. The combination of an anonymous tip and a lot of luck lead Fiedler to suspect something fishy is going on behind the scenes of Hart’s campaign. Then a throwaway line from Hart himself lights the fuse that will explode the powder-keg. Many of Reitman’s films are light and engaging, even if they’re exploring serious topics. The Front Runner is a bit more laboured than we’re used to however. It certainly takes a while to get going; and I found some of Reitman’s stylistic choices a little distancing. But once I got fully into the swing of the film, it was just as engaging as his other movies. Although the topic of an also-ran in a US election may not be all that attractive to an Australian audience, the film shines a light on the disintegration of politics and the role of the media. And those issues have (or at least should have) contemporary relevance. Of course, having Australian acting royalty in Hugh Jackman (The Greatest Showman) in the lead role is sure to boost its local appeal. Jackman delivers a nicely nuanced portrayal of a man on the edge as Hart. It’s one of his more restrained performances, but it’s all the better for that. Vera Farmiga (The Commuter) also has to dial it back as Lee Hart but does so with great poise. Her fellow Reitman regular J. K. Simmons (Justice League) however gets probably the brashest role as Dixon. But Steve Zissis (The House) just about steals the show as the rather bumbling Fiedler. Movies seem to come in at least twos these days, and The Front Runner is the second US political dramedy to land here in a few weeks (the other being Adam McKay’s Vice). This is certainly more contemplative than McKay’s rollercoaster ride, but as such it provides an interesting companion piece. If you’re into politics, The Front Runner comes highly recommended.